And I’m slowly working through the books from May of 2018, adding a few books here or there. For now, here are the latest five additions to my TBR. The Game Can’t Love You Back by Karole Cozzo is sure to be one of those books a part of me really regrets adding to my TBR or it could be one of those books that ends up being a really fun guilty pleasure. And it all depends on the writing. The last few love/hate relationship books I’ve read were utterly terrible as a result of rather mediocre writing, much of which involved the ludicrous plot point of having idiotic friends and, worse, parents point out the attraction the main character feels to the main love interest repeatedly much to the regular denial and surprise of aforementioned main character. It’s one of the most annoying plot points I’ve ever had the misfortune to read and if this book subscribes to it, then I’m definitely going to regret reading it. Hopefully, however, this particular novel won’t fall prey to the same disastrous writing as books like Perfect Harmony did. My So-Called Bollywood Life by Nisha Sharma is a book that I added to my TBR quite some time ago and just never had the chance to pick up. I’m not so sure, now that I’ve read the synopsis, that it’s a book I’m all that interested in but I figure I can read it eventually. I’m not big on contemporary novels and tend to be incredibly picky about the ones that I read. Ultimately, I don’t know how much I care about film festivals and characters who are invested in making movies. The subject just sounds quite boring to me and doesn’t really lead me to want to read a book about it. Plus, there’s a love triangle and while those can sometimes turn out wonderful stories, more often than not they leave me rolling my eyes in annoyance. I think, though, that this one will probably be well handled simply because the blurb itself calls out the love triangle immediately. I guess we’ll see how it goes. I am so excited to read Airports, Exes, and Other Things I’m Over by Shani Petroff. It almost gives me a Just Married feel, having people who were previously together in a huge fight at the airport. Though, unlike that movie, somehow I doubt that the couple in question who have broken up are going to end up staying together. It very much seems like the handsome stranger that the main character will end up meeting is going to be the final love interest. My prior feelings about the film will probably make me a little bit disappointed about that fact in the long run, but at the end of the day I’m really excited to read this book. It sounds like so much fun and I can’t wait to get my hands on a copy. 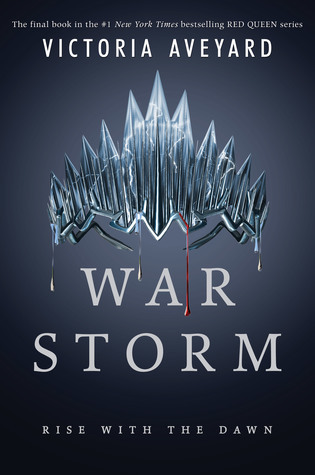 War Storm by Victoria Aveyard is literally only on here because I read the first book in the series, a novella, and I plan to finish reading it all one day. When that day is, I haven’t the slightest idea. I didn’t love Red Queen, but I did love Queen Song so I can’t help feeling as though there’s potential for me to love the other books in the series. Whether that potential will come to pass is yet to be seen. I really do need to catch up on this series at some point, though, before I end up forgetting all the things that happened in the first book. The Queen of Sorrow by Sarah Beth Durst is yet another book that has found it’s way to my TBR as a result of my wanting to read the first book in the series. I don’t know how likely I am to enjoy this book and series as I wasn’t overly fond of the one Sarah Beth Durst book that I’ve read thus far, though it was a middlegrade novel so perhaps Durst does better when it comes to young adult. I don’t imagine myself getting to this particular book any time soon, but I look forward to it when I do. And that’s the list for this week! I hope you found something interesting to add to your own TBR. What do you think of these books? Are they ones you might like to read? Do you think you’ll pass on them all? Let me know in the comments! Haha that line! Flight delayed. Send Help. Not Him! Sounds fun already 😄 Happy reading!